i in prophylaxis of manic-depressive disFirst, when is lifetime, or at least long-term, prophylaxis warranted? After one manic episode? One hypomanic episode? One depressive episode with a strong family history of manic-depressive disorder? There is insufficient empirical evidence with which to make strong recommendations, although a creative study by Zarin and Pass versus observation based on costs and benefits of recurrence risks and drug side effects under several strategies. In clinical practice without clear guidelines, such decisions need to take into account individual and family capability in reporting symptoms, rapidity of onset of episodes, episode severity, and associated morbidity. Clearly, the risks of a wait-and-see strategy would be different in a person who had a psychotic manic episode than in a j who had mild hypomania. Second, can lithium ever be discontinued? Again, there are no solid to base this decision. However, if lithium discontinuation is , there is evidence that rapid discontinuation (in less than 2 weeks) is more likely to result in relapse than slow taper (2 to 4 weeks), with relapse rates higher in persons with type I compared to type 11 disorder (Faedda, Tondo, Baldessami, Suppes, & Tohen, 1993; Suppes, Baldessarni, Faedda, Tondo, & Tohen, 1993). In those with type I disorder, relapse rate-respectively, 96% and 73%, whereas in those with type II disorder, rates were 91% and 33% (Faedda et al., 1993). 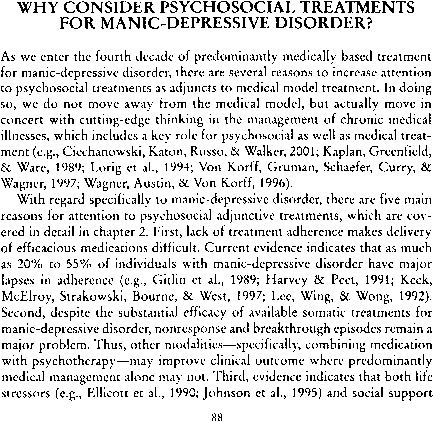 There is some theoretical concern, based on a report of four individuals, that those in whom lithium has been discontinued may not be recaptured by resumption of lithium (Post et al., 1992), but these are preliminary observations on a sample from the National Institute of Mental Health that may not be representative of persons with manic-depressive disorder seen in general clinical practice. Complex treatment strategies may be required, such as anticonvulsants plus doses of the thyroid hormone thyroxine. All psychotropic medications have side effects. Some are actually desirable (e.g., sedation with antidepressants in persons with prominent insomnia), and specific antidepressants are often chosen on the basis of desired side effects. However, side effects usually represent factors that decrease a person's quality of life and compromise compliance. 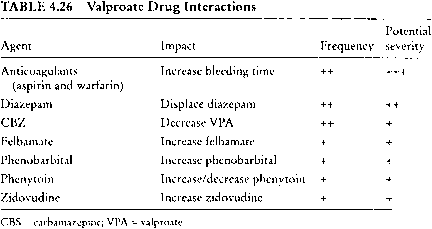 Identification of some side effects and attribution to a particular agent are sometimes easy: An antidepressant is started, and within 2 weeks the person develops impotence; a neuroleptic is begun, and within 2 days the eases, doses can be reduced, medications changed, or agents added to manage the side effects. • Does this represent a s wing into depression as part of the course of illness? In this case, increasing the lithium dose or treating with an antidepressant may be indicated. 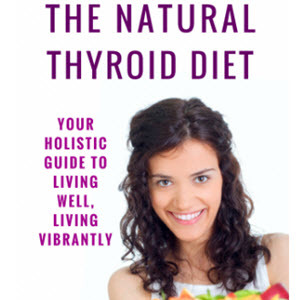 • Could the symptoms be lithium-induced hypothyroidism? In this case, thyroid supplementation would be required. • Could the person be suffering primarily from a substantial blow to his ing the manic episode? in identifying thefource of these^nore subtle changes, because there is evl dence to support several causes (Gitlin et al., 1989; Goodwin & Jamison, 1990, p, 150; Nilsson & Axelsson, 1989; Weber et al, 1977). In these situa-the psychotherapist plays an important role both in supporting the to develop strategies to cope with the temporary or permanent changes in his or her life. ; be as high in other populations (e.g., Altshuler et al, 2001). 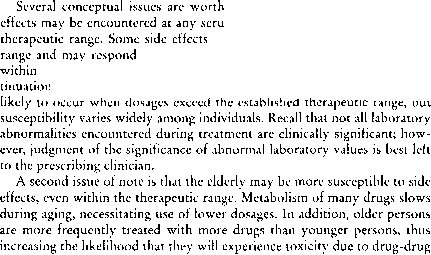 Fourth, some side effects are particularly relevant to disorder. For example, among neuroleptics it is important to keep that the frequency of tardive dyskinesia, an irreversible movement disorder associated with neuroleptic use, appears to be higher in persons with mood disorders than in those with schizophrenia (Casey, 1984). It is not clear whether this is caused by some particular susceptibility of persons with mon in treating mood disorders (mania leads to neuroleptic 1 lution of mania leads to neuroleptic discontinuation; recurrence of leads to neuroleptic treatment, etc.). Regardless, neuroleptics must be used judiciously in persons with manic-depressive disorder in view of the risk of this irreversible side effect. As another example, it should be kept in mind that all i sant treatments, including medications, ECT, and light, from depression into mania or hypomania. Rapid cycling can also Thus, initiation of these agents in treatment of the depressed phase of bipolar disorder requires careful monitoring for these effects. An but often overlooked, cause of side effects i tat an individual may be taking. 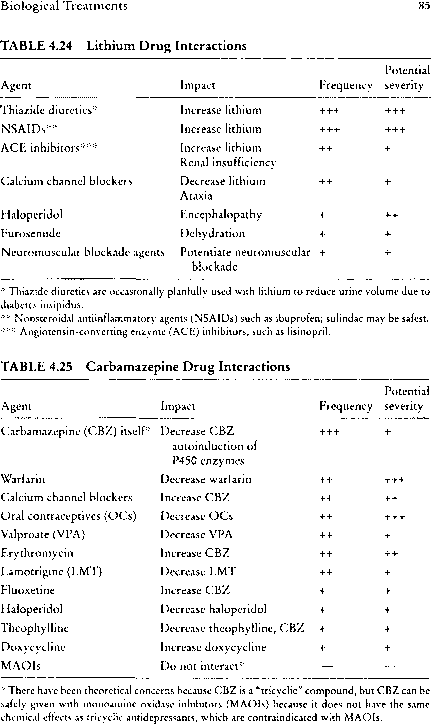 G actions with mood stabilizers and their potential clinical i rized in Tables 4.24, 4.25, and 4.26. For more coir psychotropic drug interactions, the reader is referred to work by and coworkers (Callahan, Fava, & Rosenbaum, 1993) and Cozza and Armstrong (2001). It is not uncommon for a person, who had for a long duration without problems, to develop side effects toxicity. For example, thiazide diuretics (a type of "water pill") and nonlevel and produce side effects or even serious toxicity. protein-bound. A bound drug is unavailable to caus toxic effects. Thus, the 1% of the drug that is freely circulating is ble for its effects. The addition of a second drug that competes for sites can thus substantially increase the amount of free drug without ful changes in the total serum level. For example, a second drug may the protein-bound fraction of a drug from 99% to 98% by common binding sites. This seemingly small change actually doubling of the amount of free, and active, drug (from 1% to 2%). Overall, it is clear that the less fetal drug exposure, the better—for any point of view. Furthermore, the first"trimester appears to be the most sensitive stage of fetal development for most malformations, so avoidance of drug exposure during that period is particularly important. In addition, if the mother is taking medication around the time of birth, the newborn may actually be bom with clinically relevant levels of medication in his or her blood. ECT. For example, Edlund and Craig (1984), despite risk of birth defects in women exposed to neuroleptic pointed out that these risks must be weighed in light of the increased rates of fetal death in pregnant psychotic women. Clearly, the risk of teratogenicity must also be balanced against the potential mortality and morbidity of untreated manic-depressive disorder due to the potential for suicide, risk-taking behavior, and drag and alcohol use. articularly the prescribing clinician, must support the indi-by providing accurate information and support through the decisionmaking process. But decisions regarding such profound matters of life, death, and serious morbidity are ultimately borne by the individual and his or her family. depressive disorder. Thus, modulation of these factors, not directly s to medication treatment may improve outcome (reviewed in Johnson et al., 1999). Fourth, social, family, and occupational dysfunctions are the rule rather than the exception. Such functional deficits may persist in the absence of major affective episodes, and even subsyndromal levels of depression appear to be a strong predictor of ongoing functional deficits. Finally, manic-depressive disorder is a costly illness, and it is possible that psychosocial interventions in addition to medical model treatment may reduce costs. & Gutheil, 2001). This chapter covers a wide range of several that are highly structured and supported by research purposes or evaluates study data.